Table for 2.... or more: Kedah Perlis Malaysian Food Fest Starts Today! 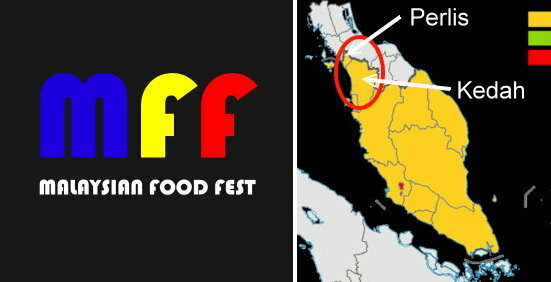 This month’s Malaysian Food Fest will feature two states, Kedah and Perlis together. Last month was another great success! 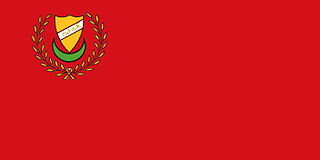 Hop over to Lena's blog to see the round up for Terengganu state. Frankly, this is a huge task for me as there isn’t much information on the internet for me to gather. Although I have been to both states, but it was only Langkawi and a 18 hour stopover at Kangar to wait for the train. That is not enough for me to understand the food well enough. Anyway, I’ll try my best. If anyone can help with adding in more information, it’s greatly welcomed. Let’s talk about Perlis first. Perlis is the smallest state of Malaysia and is most northern state on the peninsula. The economy of the state is mostly based on agriculture produce like sugar, rice and fruits, especially the Harum Manis variety of Mango, of which is very very fragrant. Due to it being once under Siamese rule, the cuisine displays a heavy Thai influence. The locals love eating glutinous rice cooked in coconut milk. The usual practice from Thailand is to have it with mango, but the locals will eat it with bananas or even ciku. Not very touristy, but it’s common for the farmers in the state. They also eat sticky rice in place of regular rice with salted fish or other dishes. Perlis people are also very fond of laksa, not the laksa found in other states. If you are making a trip there, make sure you don’t miss their very very special laksa. It’s made with a very very special ingredient. An ingredient that is long and slithery….. It’s eel. Eel Laksa! Now, if you gladly eat unagi at Japanese restaurants, what’s so scary about eating eel laksa? It’s nothing, right? Besides making laksa gravy with eel, they have the regular fish laksa too. Laksa Perlis is the same as the laksa Kedah, but the toppings are slightly different. Raw shredded local herbs like daun selom are added in as well. I’ve heard from my friend who has been staying in Perlis for many years that they have a local practice of eating fried rice vermicelli with laksa gravy, yeah bihun goreng laksa : ). Such is their love for laksa. Kedah is known as the rice bowl of Malaysia. Rice fields are as wide as the eye can see. Due to this fact, Kedahans eat fish caught from the rice fields. In those days, Snakeheads(haruan) and catfish(semilang/sembilang) are a common part of their diet, but nowadays these fishes are not as easily found as before. They not only eat freshwater fish, but marine fishes as well. Ikan Temenung (known as kembung in other parts of Malaysia, or in English, Indian mackerel) is the one of the popular fishes here. Made ever so popular when cooked in curry, called Gulai Ikan Temenung or made into Assam Pedas. Generally the food of Kedah has influences from Thailand and Sumatra. That is the reason the dishes mostly comes with hot and sour tones and they love gulai. Kedahans also like to eat laksa and their version has similar gravy as Perlis, but authentic Kedah laksa is topped with cashew shoots, and many other astringent shoots too, besides the common cucumber and onions. Like most northern states, they have immense love for glutinous rice. The ketupat in Kedah is different than other states. 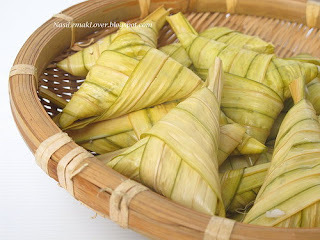 It is made with the leaf of the palas palm and is shaped like a triangle and filled with glutinous rice. Either boiled or steamed, it is served with rendang or curry. 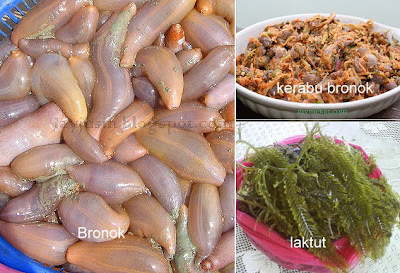 Langkawi, a beautiful mythical island in Kedah, have their own specialties and they are from the sea. One of the specialty is also slithery, soft and squidgy. It’s called Beronok, a type of sea slug. 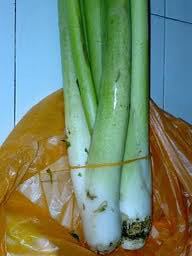 It can be made into kerabu, a salad. Another specialty from Langkawi is Laktut. Nothing fearsome, it’s just seaweed. Usually eaten raw, dipped in sambal. Apam Perlis - It's similar with thai pancakes, except that it seems to be more generous with the filling. I've made this with a combination from a few recipes. 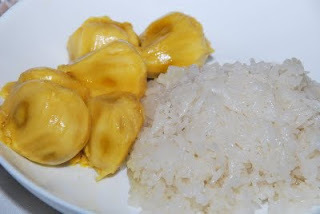 Pulut Pelam/Pisang/Ciku – Mango sticky rice, also can be made with banana and ciku, or even cempedak. Kuih Qasidah, I heard from my Facebook friend Norehan, that this is a really old fashioned kuih that is popular among the Arab descendants in Kedah, hence the use of ghee and the name. But it seems that modern versions do not use ghee but just fry the shallots in oil. Kuih Lepat Liat - Also introduced to me by Norehan. Easy to make and delicious. I've made this, you will see the English recipe soon. Kuih Gedung Chak , not easily found nowadays as it's made with Nipah leaves and grilled on open fire. I will be doing a modified version using banana leaves. Bunga Pudak - A lesser known traditional cookie, made with glutinous rice flour and coconut. The recipe sounds good, except for the amount of salt, it's probably a typo. Try this out with some adaptations. Cucur manis, bananas fried with banana batter. Double dose of naners!!! Lengat Pisang, steamed banana kuih with just 4 ingredients plus 1 pinch of salt. Laksa Kedah, Kedah style laksa, served with a sprinkling of local herbs. English version, visit Hody's. Nasi daging utara- Northern beef rice, rice cooked in a spiced beef broth, served with tomato relish. I'll be posting this. It's not the same as Penang style nasi daging of which is more "curry-fied", hehehe. Gulai ayam utara – Northern curry chicken, with mint, smells refreshing! Ayam masak Asam- Chicken cooked with Tamarind, it's spicy too! Asam pedas utara –Hot and Sour fish, northern style. It's quick and easy to do. Gulai Ketam dengan Nanas- Crab Curry with Pineapples, crab and pineapple fans do take a look! Mango Kerabu, northern style Mango Salad. 1. Who can join? Anyone can join. Come let's replicate some Kedah or Perlis Food at home! 2. Prepare a dish ( sweet or savoury ) that is from Kedah or Perlis, be it old time favourite, modern goodies or dishes that has been localized. Take a picture of the food or many pictures. If possible, tell us the story about the dish, share with everybody so that others will learn. Please read FAQ on what make the dish a localized dish. 4.Submit your entry latest by 31 November 2012 except for Facebook submissions.
" I am submitting this post to Malaysian Food Fest (link to MFF page), Kedah and Perlis Month hosted by WendyinKK of Table for 2..... or More (Link to this post) "
Bloggers can submit old recipes to Facebook. Anyone that has once cooked a Kedah/Perlis dish and have a picture and recipe can submit to Facebook. Not necessarily a recently done dish. A Round Up will be done for all blog entries and emailed in entries on December 01, 2012. Facebook entries are not included in the round up.